Alkyl halides (or tosylates) will react with the hydrosulfide ion (HS‾) to give thiols. Sulfur is in the same column directly below oxygen in the periodic table, and therefore, one might expect the sulfur analogs of alcohols to behave in a rather similar manner. 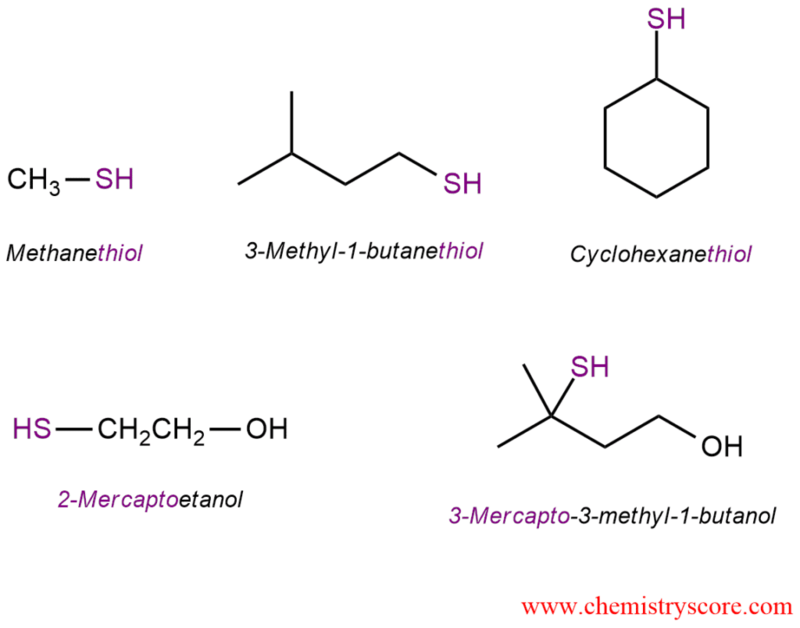 Sulfur analogs of alcohols contain an SH group in place of an OH group and are called thiols in the IUPAC system. The nomenclature of thiols is similar to that of alcohols, but the suffix of the name is “thiol”: name of alkane + thiol = alkanethiol. The SH group is referred to as mercapto, and its location is indicated by numbering the longest chain. Thiols react like alcohols but sulfur in these compounds is even more nucleophilic and much less basic than the oxygen in alcohols. Thiols are usually prepared by using the hydrosulfide ion as a nucleophile (HS‾) in an SN2 reaction with an alkyl halide. Hydrosulfide ion is an excellent nucleophile and a poor base. A large excess of the HS‾ is used in the preparation of thiols to ensure that the product does not react with the starting halide to give the dialkyl sulfide. This reaction can occur even at secondary substrates where inversion of configuration is observed.